The story behind the evacuation of Dunkirk during World War II is an incredible one. British and other Allied troops had been essentially backed into a corner, stranded on a beach with no route home and the German Army cutting off all land routes. 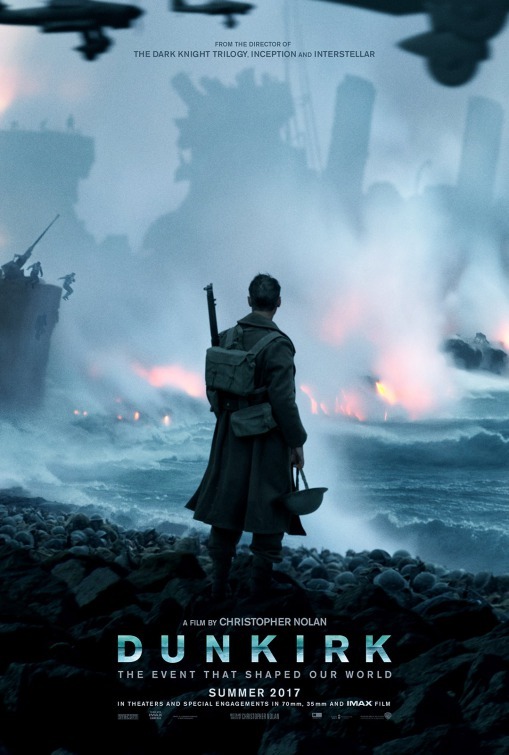 That story is being told once again in Dunkirk, the new movie from director Christopher Nolan. The movie tells the story of what happened to those on the beach with nowhere to go and no way back to friendly territory from three perspectives. On the land, there are the hundreds of thousands of troops who are waiting for rescue while trying to survive regular bombardment from the Luftwaffe. In the air there’s the Luftwaffe, who are the only German force harassing the troops and the Royal Air Force meeting them for battle. On the sea there’s the story of the makeshift navy made up of British fisherman and other civilians who were called upon to cross the English Channel and actually rescue the troops stranded in Dunkirk. Another poster used an extreme close-up of one of the soldiers on the beach, his comrades scattered around him and fires burning in the background setting the scene. The same message of how the soldiers were stranded so “home came for them” is used here but it’s notable that this new approach is less about the scale of the story and more about the human element. An IMAX poster changes perspective from the rest of the poster campaign, this time showing one of the civilian boats that’s heading toward Dunkirk, the flames visible in the distance and men swimming desperately toward the boat. IMAX gets big brand placement here, bigger than the title treatment. Another shows soldiers climbing out of the sea onto a rescue vessel while fighter planes and ships smoke and do battle in the background. A motion poster was basically a quad graphic showing a couple battleships on fire as the camera slowly zoomed in. The first teaser is very much just that. Between shots of a beachfront with groups of soldiers standing on it we’re reminded this is coming from Nolan, with The Dark Knight Trilogy and other movies being name-dropped. At the very end we see a transport boat full of soldiers and hear a plane coming in on a bombing run before it cuts to black. All the shots are wide and hazy, establishing the style of the movie but not really hinting at the story with the exception of a couple title cards that tell us “At the point of annihilation…survival is victory.” It’s a good teaser but will do little to nothing for the casual fan. The first official trailer is an emotional one. It starts out by establishing the danger the 400,000 troops arrayed on the beach are in, receiving threats from the German army and generally feeling penned in. Soon the attacks start and are unrelenting, with soldiers seeking shelter anywhere they can or going mad with fear and, as we see, just walking into the ocean. It’s framed by conversations with the officers about the situation they’re in. It’s pretty powerful stuff. Nolan’s name is all over it, usually associated with The Dark Knight Trilogy and other movies audiences have previously enjoyed. Aside from that, though, what’s promised here isn’t a war movie like Saving Private Ryan that’s brutal but uplifting. Instead it’s more about showing resilience in the face of overwhelmingly bad odds. 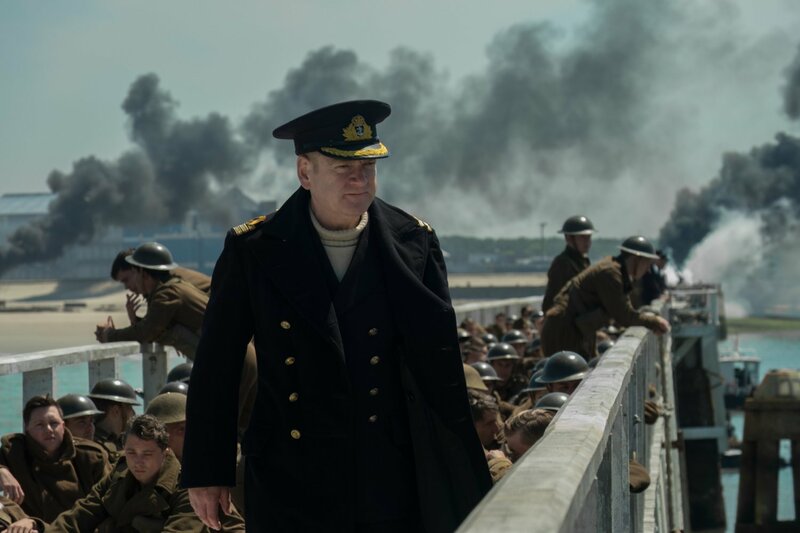 There’s little star power on display – a couple shots of Murphy and Hardy, with more of Kenneth Branagh – so it’s more concerned with both the story and the director’s brand. The second trailer starts out by showing the scope of the military situation at hand, with hundreds of thousands of soldiers stranded on the beach and constantly facing attack. The perspective then shifts to the everyday sailors who were called upon to go get them, even as the enemy kept up the pressure. It’s a race against time as the massive rescue operation gets underway even as the German air force keeps up the pressure to take them all out. Again, the focus here is on the scope of the story even while it is given a few different very human and personal faces. It’s a big dramatic war story that’s being told and it’s that which the trailer is promising. Another short trailer was specifically designed to promote 70mm IMAX presentations and amps up the tension with loud music, fast cuts and narration about never surrendering, even as bombs drop and planes fly over. The official website for the movie starts off by playing the main trailer, which is worth your time to watch again. Once you close that or it finishes you’re greeted with the main page that uses the key art with the close up of the soldier on the beach, the ravages of war in the background. There’s also a big “Get Tickets” button there that encourages you to find a location playing the movie in 70mm. Buttons below that include “Watch Trailers,” which takes you to a section that lets you watch all three of the trailers. Then there’s a link for the “Soundtrack” where you can choose to buy the album on iTunes or elsewhere or stream it on Spotify or Apple Music. “Worldwide Release Dates” is just what it sounds like. The first two options in the row of prompts at the bottom relate to the VR experiences created to help promote the movie. “Web VR Game For Chrome” (some clunky branding there) is a Google-powered WebVR experience that allowed you to play alone or with a friend and get an idea of what life on that beach might have been like. “Save Every Breath: The Dunkirk Experience” is a bit more full-featured, developed for use on Oculus or other VR platforms that take you inside the events of that fateful period. Next is “Amazon Skill,” which is a skill you can add to Alexa devices offering a narrated adventure game allowing you to play as a solider at Dunkirk who must survive all the dangers there. “Unlock Dunkirk” offers facts and stats from those days on the beach that were unlocked by people who posted to Twitter using #Dunkirk. You can explore what’s already been unlocked or Tweet something yourself to find out more. After that the “Prologue Experience” is a map/schedule of theaters that have been showing snippets from the movie containing all three story perspectives. Finally at the bottom of the main page are links to the movie’s Facebook, Twitter and Instagram profiles. TV spots like this one focus exclusively on the tension that comes with trying to fight off a massive army while being stranded on the beach. There’s nothing here about the heroism of the British public in mounting an ad hoc naval rescue or anything else, it’s just about the bombs and the strafing runs and other action. More TV commercials kept hammering on different aspects of the story, from the desire to get home to the call to do your duty for Queen and Country to the desperation of the men on the beach. Outdoor billboards used variations on the posters, with shots of the airplanes, ships and more that were involved in the battle and rescue around Dunkirk. Online ads used similar imagery while social ads used the trailers to promote ticket sales. The very first bit of publicity about the movie – indeed the first time people knew the movie was coming – was when Warner Bros. gave it a release date. A few months later it was finally confirmed what the movie was as well as a few other details about the cast and production. Reports surfaced back in December that a seven-minute preview of the movie would get a big stage, rolling in front of select screenings of Rogue One: A Star Wars Story. That got everyone talking about Dunkirk again. Later on there were profiles of the cast, including Fionn Whitehead, who was making his feature film debut. Nolan also talked about the approach he took with the story, including the three different perspectives that move the plot along and how he took pains to pare down the dialogue to create a sense of starkness. The director also justified why he sought a PG-13 rating and how it played to what he was trying to accomplish with the story. He kept talking about working with IMAX, how he views the story and more. A very brief featurette had Nolan talking about the real life story being told and why he felt it was so compelling. The film format became a story of its own, particularly since it was announced it would have the largest 70mm release in decades. That was something that Hollywood was advised to pay attention to as it could signal some strong consumer preferences. It was also pointed out that historical war stories like this are new ground for Nolan, who has rarely dipped into the past at all. Nolan not only talked about the nerves leading up to release but also how he pulled some inspiration from previous movies like Mad Max: Fury Road and Gravity that seem to be telling the expanded third act of a story we’re joining in progress. He also addressed how Harry Styles is hidden in the marketing, an intentional decision to not oversell his part in any way and to acknowledge that this is the story of a massive army, not a single individual. Usually I find myself needing to take several points off the campaigns for movies based on historical events because they don’t do enough to provide background and information on those actual events. Dunkirk, though, goes hard in the opposite direction, with every aspect of the campaign reinforcing the facts around what transpired on and around the beach and giving the audience a history lesson. The posters and trailers all contain facts and figures on the scale of the crisis and the efforts mounted to rescue the stranded soldiers. And the multiple VR and online experiences devised by the Warner Bros. team are all designed not to just explain to the audience what happened at Dunkirk but provide a virtual means to experience a small slice of that themselves. All of that comes in the context of this being the latest movie from Nolan, who, as I’ve said when analyzing the marketing of some of his previous movies, is as much a franchise as any superhero or sci-fi series. He has significant mainstream name recognition as well as a stellar reputation with film critics and others that all adds up to a sizable built-in audience for his new movies. The campaign trades on that heavily, making sure we know this is coming from the director of Interstellar and other movies. It all adds up to a campaign that sells the movie as a prestige event, one that’s likely to please general audiences as well as those who consider themselves serious cinephiles. Tagged: christopher nolan, dunkirk, warner bros.